With this catalog Atari changed the part number as well as the cover artwork. This catalog features a red cover and each page has a thick red border at the top. Four new titles were added and two removed over the previous one, bringing Atari's title count up to 42. The new titles were Asteroids and Othello, Video Pinball, and Warlords. The titles removed were Space War and Miniature Golf. 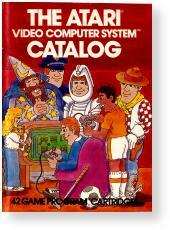 This is the first Atari catalog to proclaim the number of "Game Program Cartridges" on the front cover. Records Found: 42 Click on a column header to sort by that column. Click again to reverse sort order.